Patty Sheehan & Friends is the 6th tournament scheduled in the LPGA Legends Tour. Being an Official Legends Tour of the LPGA, the event showcases the incredible talents of some of the greatest women golfers of all time. The Legends Tour has over 100 members, including 10 World Golf and LPGA Hall of Fame members. Known for their unquestionable skill, enthusiasm and lifetime dedication to golf, these trailblazers still create once in a lifetime opportunities for golf fans of all ages. The Legends Tour is celebrating its 10th season and has played for over $9.3 million in prize money and over $10 million has been awarded to various charity organizations. 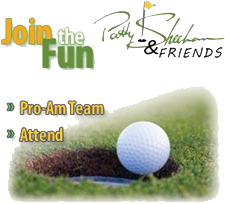 Golf legend Patty Sheehan wishes to continue and contribute this honorable tradition and is establishing Patty Sheehan and Friends as a venue to support children’s and women’s charities throughout Northern Nevada.